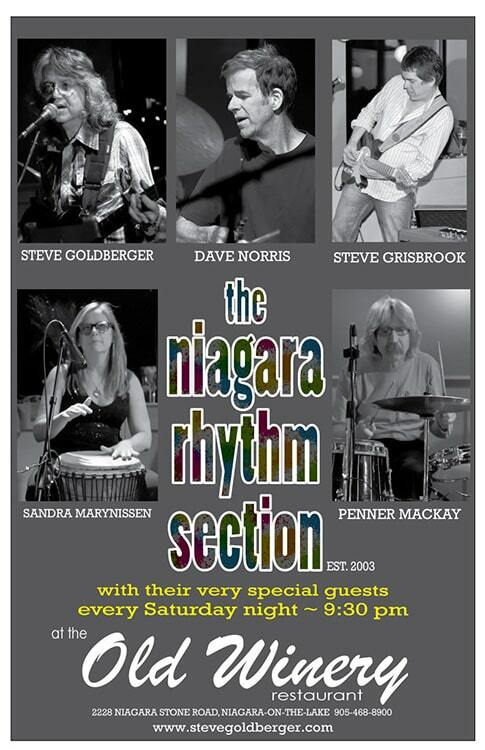 The Niagara Rhythm Section was formed in 2003 when the Anchorage Inn in Niagara-on-the-Lake was looking for a band every Saturday night for a six-month gig. Six years later when the Anchorage finally closed its doors, they were still there. Without missing a beat they continued their Saturday unrehearsed musical adventures just down the road at Corks for about a year. Moving on from Corks in Oct 2010 the boys continue rockin’ out every Saturday night in their new home, the beautiful Old Winery Restaurant. The core of the band consists of Steve Goldberger on bass and vocals, Steve Grisbrook on guitar and vocals, Dave Norris on drums, Penner MacKay on Percussion, Sandra Marynissen on percussion and either Denis Keldie, Rodger Niznik or Herb Nelson on organ or piano. While the band is pretty fantastic and put on a great show of their own, each week they invite a different guest recording artist to front the show. They come from far and wide (all over Ontario and Canada, the US and even England) and cross over all styles of music including blues, R&B, country, folk, pop, jazz and even Brazilian; all performing with the NRS without any rehearsal. It’s a true jam session every week.